When mineral springs and Indiana are referred to together, we typically think of West Baden Springs or French Lick in the southwestern portion of the state. These resorts have long provided a place to relax, vacation, and enjoy the mineral waters that naturally flow from springs in the area in a spa-like atmosphere. 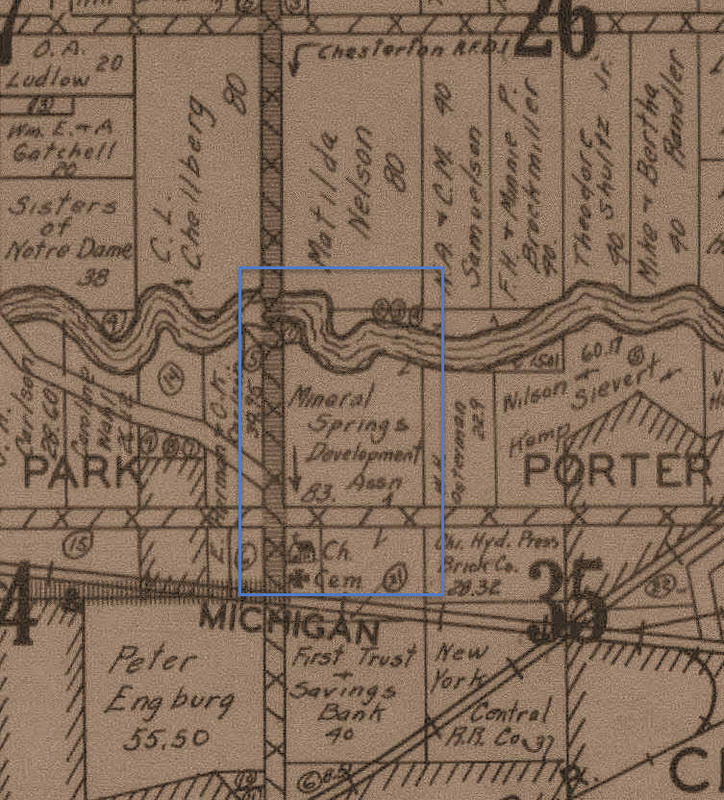 If you are familiar with the northern portion of Porter County, then you may have come across a road named Mineral Springs that traverses in a north-south direction west of downtown Porter. 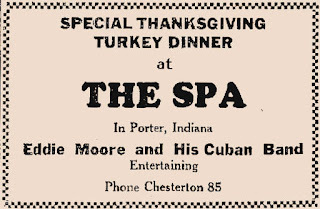 You may also remember The Spa restaurant was located along Mineral Springs Road. Originally constructed in 1928 and heavily remodeled in 1955, it closed in 2002. 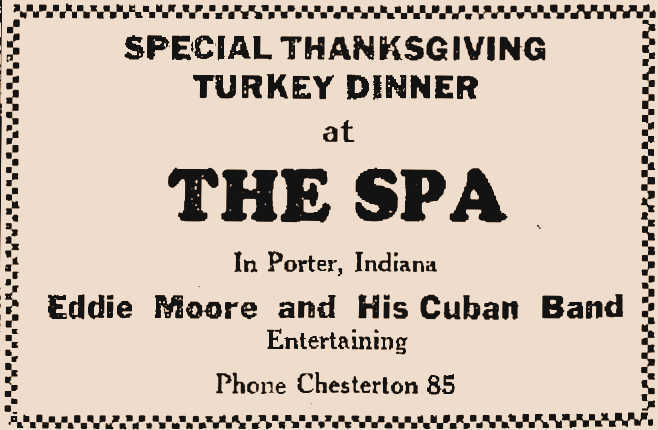 The Spa was a high-end restaurant that also served as an entertainment venue. Today, Spring House Inn conducts business on the property. entertainment venue that was located on Mineral Springs Road. Source: The Vidette-Messenger, November 29, 1933. An aerial view of The Spa, 1956. 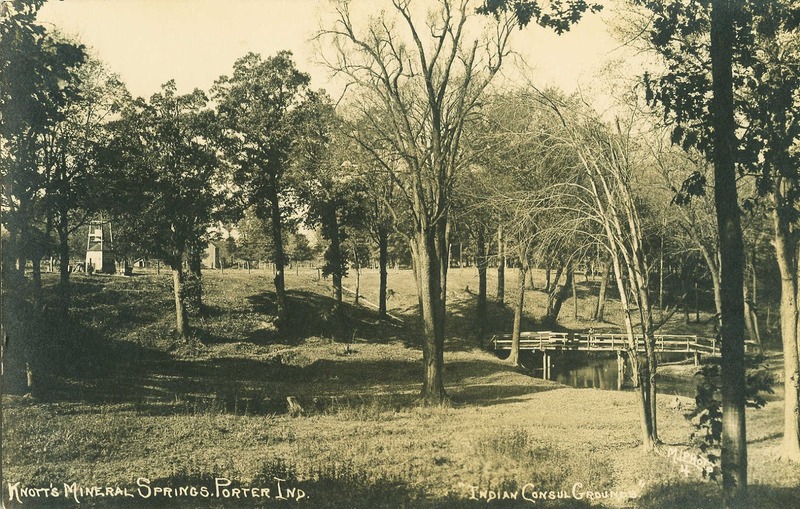 The development of mineral spring resorts in the northern portion of Porter County initially gained traction as part of a diversification strategy by the Porter County Land and Manufacturing Company, commonly referred to as the Porter Land Company. This company was a successor to the Chicago Porter Home Investment Company. 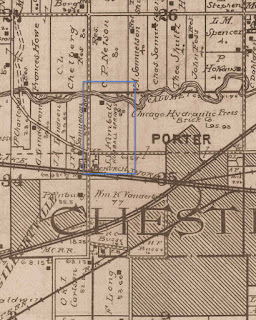 The Porter Land Company purchased more than 1,200 acres of land in and around the towns of Porter and Chesterton. The Porter Land Company was primarily focused on diversified real estate development; it was headquartered at 89 Madison Street in Chicago. 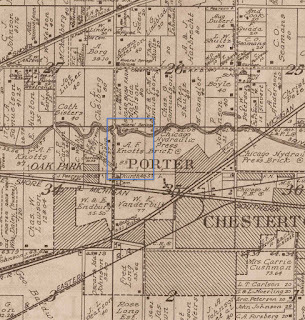 Even prior to incorporating, company directors from the east had induced some business concerns in Massachusetts to relocate manufacturing plants to the Chesterton and Porter area. For instance, the company signed a contract with American Brass Works of Cambridge, Massachusetts, on February 15, 1894, to relocate a plant in the area to produce brass plumbing fittings. Soon after, at least thirty men in the Westchester Township area were employed in the production of brass goods. 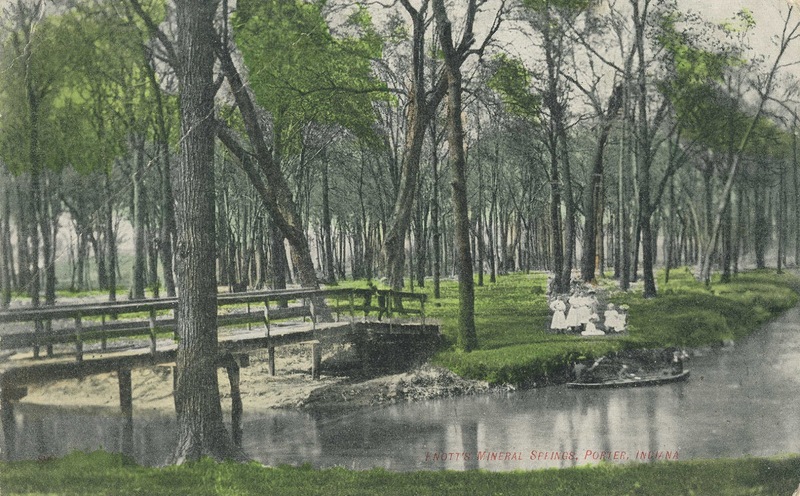 includes information concerning the Carlsbad Artesian Mineral Springs in Chesterton. Source: The Westchester Tribune, January 2, 1897. The Porter Land and Manufacturing Company filed articles of incorporation on May 25, 1894, with a capital stock of $500,000. The directors of the company were P. D. Pike, Jasper T. Darling, and T. H. Glover. Soon after incorporating, the company was erecting homes, selling them mostly to laborers of the various manufacturing plants in Chesterton and Porter. At one point in time, the company owned over 3,000 platted lots in Chesterton and Porter. By early 1895, the brass manufacturing business was in peril and seeking recapitalization, as well as a receiver to protect it from creditors. On February 25, Judge Gillett, in Crown Point, Lake County, Indiana, appointed Arthur J. Bowser, publisher of The Chesterton Tribune, as receiver of the American Brass Works in Porter. It should be noted that the Porter Land Company incorporated at the height of the economic depression of the 1890s. The panic of 1893 resulted in a major collapse of agricultural commodity prices that eventually hemorrhaged across nearly every industry in the United States. Deflation, combined with high interest rates on debt, resulted in an enormous number of business defaults, dissolutions, recapitalizations, and bankruptcy filings. By 1894, the national unemployment rate had reached 18.4 percent. Some regions were impacted more by the panic than others; the unemployment rate in Michigan, for instance, peaked at 43 percent. In July 1895, The Porter Land Company sold 800 acres to a syndicate headed by S. S. Kimbell (surname occasionally misspelled as Kimball), which already had land holdings in the area. Spencer Smalley Kimbell was born at Jefferson, Cook County, Illinois, on October 8, 1842. A veteran of the Civil War, serving in the First Illinois Artillery, he returned to Chicago after the conclusion of the war and began to engage himself in the stone business, eventually gaining an interest in the Singer & Talcott Company. In 1874, Kimbell sold his interest in Singer & Talcott and purchased an interest in the Excelsior Stone Company. In 1881, Kimbell exited the stone business and ventured into a the manufacture of brick, incorporating as Purington-Kimbell Brick Company. Brick demand in Chicago was extremely high and Kimbell's business prospered. He incorporated another company, Lockwood & Kimbell, in 1882, that was also focused on the manufacture of brick. 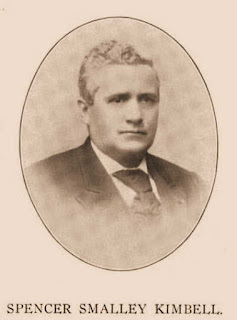 Photograph of Spencer Smalley Kimbell. Consolidation of the fragmented brick industry in the midwest took place in the 1880s and early 1890s, and Kimbell's business concerns were merged into a new company called the Chicago Hydraulic Press Brick Company; by 1900, this company was producing more than 75 percent of all the face brick being used in Chicago and surrounding communities. This included brick manufactured by the company in Westchester Township in Porter County, Indiana. Approximately 60 of the 800 acres of land purchased by the Kimbell syndicate in July 1895 was located in the west one-half of the northwest quarter of section 35 in Westchester Township. It included the land where The Spa restaurant operated, as well as some land located immediately east of Augsburg Evangelical Lutheran Church. 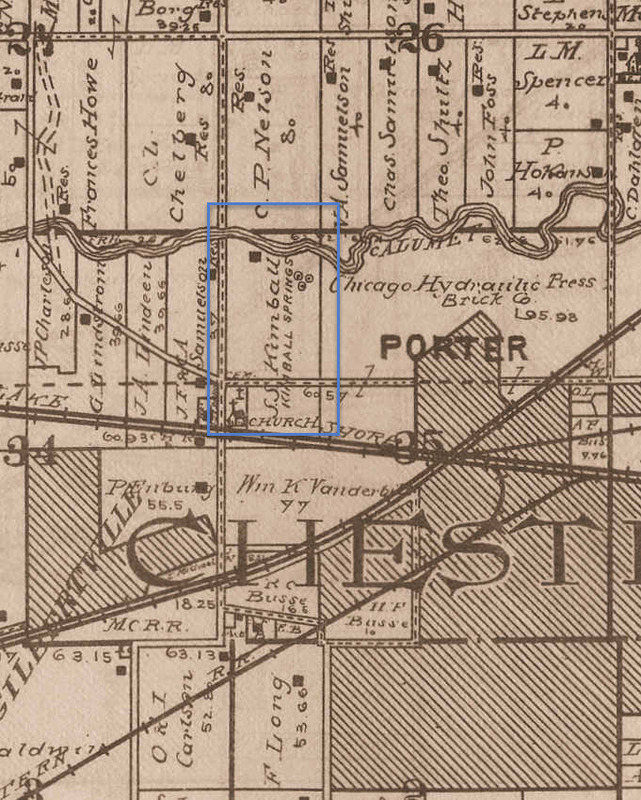 In 1896, Arthur J. Bowser, publisher of The Chesterton Tribune, was acting as receiver of the Porter Land and Manufacturing Company, which implies that the company was experiencing difficult financial situation and required protection from creditors. Apparently, the company was recapitalized and/or reorganized since it was later engaged in numerous business transactions in the northern portion of Porter County during the late 1890s and into the early 1900s. 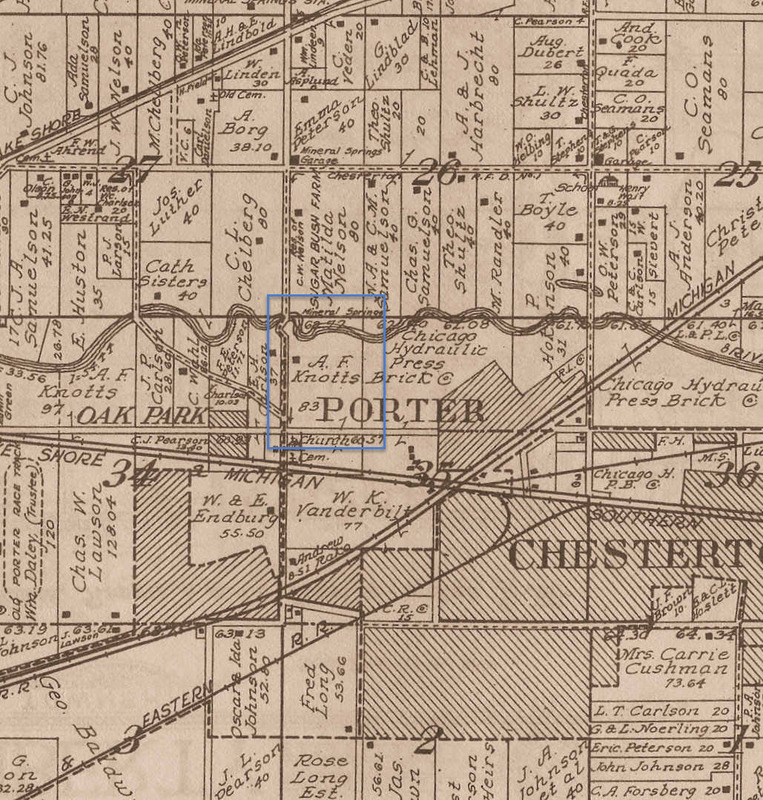 The Porter Land Company had a well drilled on property the company owned in Chesterton during the 1890s. The drilling resulted in an artesian well, a naturally flowing well created by positive ground pressure below the ground surface. 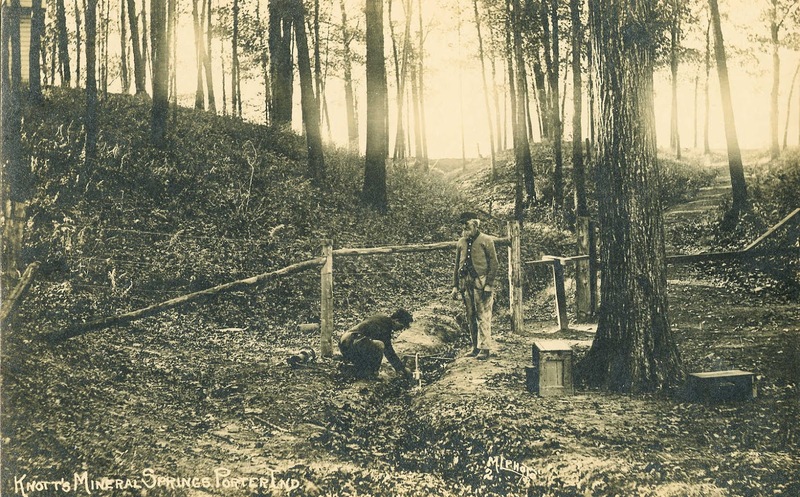 Artesian wells were considered quite unique in the United States during the late 1800s, especially if the well produced water with high mineral content, which is exactly what the Porter Land Company's well possessed. 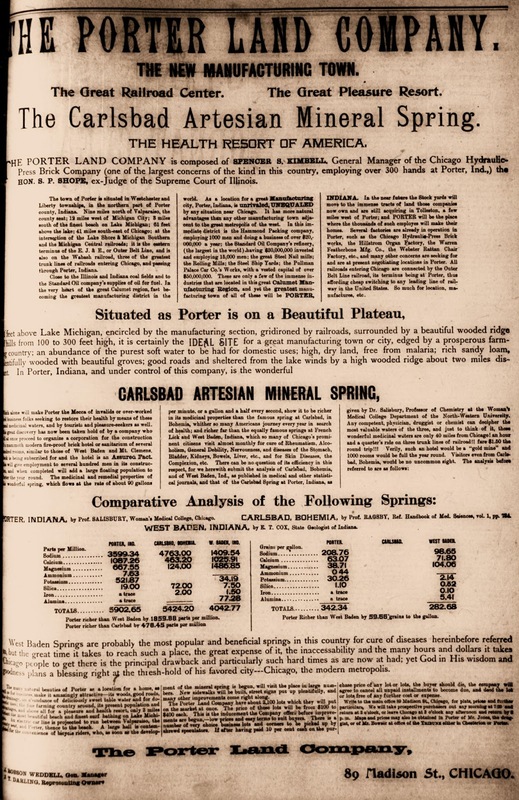 The Porter Land Company named their well Carlsbad Artesian Mineral Springs, most likely in reference to the popularly known Carlsbad Springs in California. 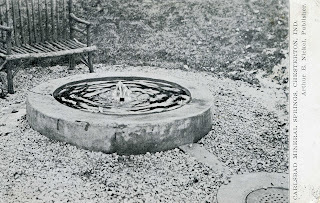 This artesian well was located in the south one-half of Block 34, which is bounded today by Porter Avenue on the north, Park Avenue on the south, Jackson Boulevard on the west, and 15th Street on the east. 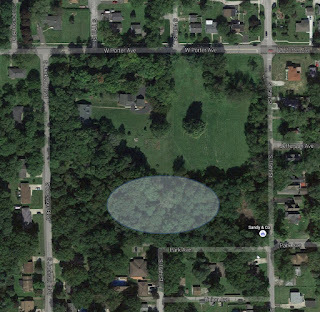 Presently, this property remains an undeveloped tract surrounded by residential housing. 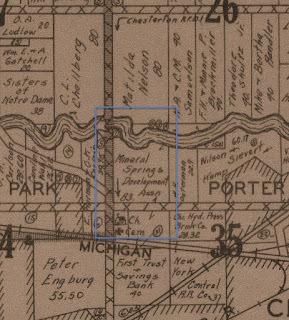 Artesian Mineral Springs in Block 34, 1906. The Porter Land Company will at once proceed to the construction of a mammoth modern fireproof brick hotel or sanatorium of several hundred rooms, similar to those at West Baden and Mt. Clemens. Stock is being subscribed for and the hotel is an assured fact. The Carlsbad Artesian Mineral Springs was soon being widely advertised, its waters being a veritable cure-all for all known human maladies. This Chesterton mineral water was reported to alleviate or cure rheumatism, alcoholism, general debility, nervousness, skin diseases, and diseases involving bladder, bowels, kidney, liver, and stomach. The Porter Land Company of Porter; capital stock, $250,000; directors, Helen P. Evans, Jasper T. Darling, Clarence W. Shape, Henry F. Harris, Elizabeth C. O'Brien. Mrs. Nettie Metz, of Chicago, arrived the Springs last week, hardly able to get around. After drinking the waters for a week she is as lively as a three year old. Miss Mary Kohl and Mamie Gangolf, of Chicago, spent a very pleasant week at the Carlsbad Mineral Springs. James A. Watson, Mrs. Katharine Lowa, Mrs. C. W. Crone, all of Chicago are stopping at the Carlsbad Mineral Springs. Although the rainy weather last week delayed progress on the Carlsbad Mineral Springs cottages, still they are pushing things along as fast as possible and while they are not fully prepared to receive guests, a number arrive every week who cheerfully take things as they are and leave with a feeling of satisfaction and regret they could not stay longer, and all promise a speedy return. 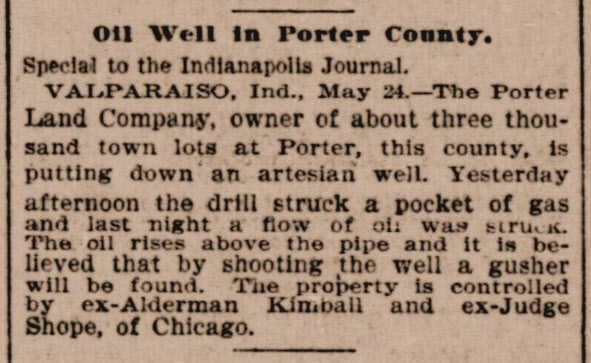 In May 1899, another artesian well was drilled on S. S. Kimbell's property in Porter. 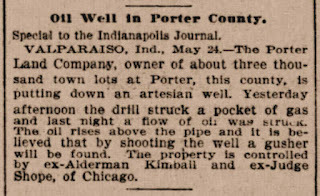 Ironically, the Porter Land Company, which owned the Carlsbad well site, drilled the well on Kimbell's property. This well initially struck oil, leading to an oil geyser, but further drilling quickly exhausted the oil reserve and mineral water began to freely flow from the well head. S. S. Kimbell's property in Porter, Indiana. Source: The Indianapolis Journal, May 25, 1899. 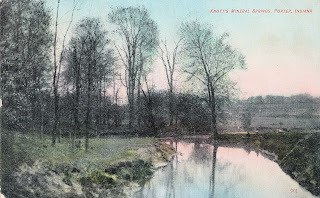 S. S. Kimbell's property and mineral springs, 1906. After Kimbell's well was flowing, it was "off to the races" as Kimbell and The Porter Land Company attempted to develop their artesian well properties into mineral spring spas. Postcard image of Carlsbad Artesian Mineral Springs, circa 1907. 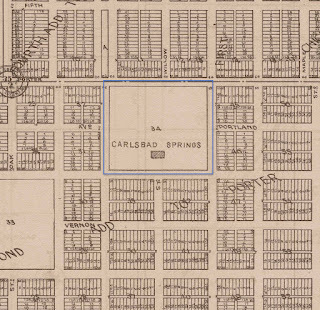 It is believed that neither the Carlsbad or Kimbell artesian mineral springs were generating enough business sufficient to satisfy their owners. Both artesian well owners had significant land holdings in Westchester Township and both were diversified in a number of land-related businesses. Hence, it was probably a natural consequence that both businesses attempted to leverage their artesian wells into other business ventures; owners and associates of the Carlsbad Artesian Mineral Springs appear to have made the first significant move. J. H. Busse has sold a tract of land formerly a part of the old Suman farm in Liberty township to a Chicago syndicate. Report has it that this syndicate proposes building a race track on the property an run out trains from Chicago to carry the crowds. Carter, who was one of the Carlsbad Springs promoters, is said to be behind the project. It is also hinted that Pete Crumpacker, of Hammond, is one of the backers of the scheme. Whether his name is used for effect or not, we are unable to say. If another Roby is to be planned in Porter county, you just watch the fur fly. Wabash officials were here Monday, and laid out the new side track from their line to the new race track on the old Suman farm. This track is now laid, and the work of building a half a million dollar race track has begun. This is the biggest thing that ever happened in Porter county, and those who have seen the plans, Contractor Amling being one of the few who have, are simply astounded. It is believed that it is the Roby outfit moved into Porter county. The Tribune is busily engaged in getting reliable information concerning the venture, and hopes to be able in the next issue to give its readers a truthful statement of what is going on, what may be expected, and who are behind the undertaking. Today there is nothing but guesswork to draw on. The utmost secrecy is being maintained by those behind the undertaking, and not a single metropolitan newspaper has as yet got an inkling of the project. The "old Suman farm" referred to in the article consisted of approximately 55 acres in the north one-half of the northwest quarter of section 11 in Liberty Township, immediately adjacent to and south of present day Dogwood Park. 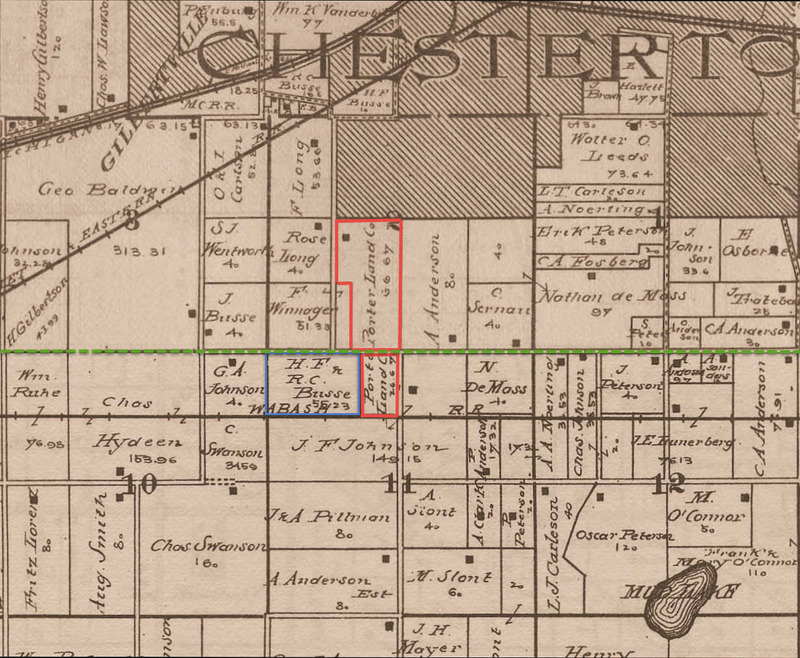 John Henry Busse's property was adjacent to property already owned by the Porter Land Company. 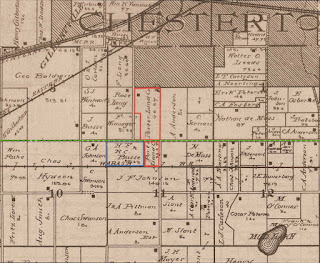 Furthermore, the Wabash Railroad ran along the entire length of the southern boundary of Busse's property, making it an ideal location for a rail stop. Busse and the Porter Land Company, 1906. Green line represents township boundary (County Road 1100 North). Attempting to get the scoop on what was occurring with the Busse property transaction, newspaper reporters quickly determined that the property was not purchased with the intention of developing a horse racing track, but instead was purchased for the development of a large gambling resort. and horse racing track in Liberty Township and Westchester Township. Source: The Fort Wayne Journal Gazette, April 11, 1905. The Chesterton Tribune reported a week later, on April 6, 1905, detailed information concerning the proposed investment in land in Liberty Township and its connection with the Carlsbad Artesian Mineral Springs. Monster Betting Resort, Not Track, is Planned at the Indiana Town. Ample Protection to Run is Claimed by L. Jay Carter, of Chicago, One of the Promoters. Mystery surrounding the proposed new racetrack in Indiana in the neighborhood of Porter was explained away today when it was learned that the plans now include a monster poolroom and casino. The racetrack is to be a future consideration and is believed to depend on the situation in Chicago. It is claimed by one promoter, representing the capital to be invested, that protection has been secured all the way down in the state. In one sporting quarter it was said that Jim O'Leary was back of the deal. The spokesman of the proposed syndicate is L. J. Carter, a real estate dealer, with offices in the Hartford Building. He is now accepting bids for concessions like the bar, where hard drinks will be served. The plant is to be called Carlsbad. Carter is also the promoter of a huge hotel scheme in Porter, modeled on the same lines as the hotels at West Baden, French Lick, Hot Springs and other resorts. It is claimed that this hotel, which is also to be called the Carlsbad, has no connection with the poolroom end of the game. President -- William E. Mason, ex-United States Senator, Chicago; vice-president, David W. Medbury, formerly department of justice, United States, chicago; secretary, L. Jay Carter, Chicago; treasurer and general manager, B. S. Cook, Superior, Wis.; medical director, H. Jefferson O'Brien, Superior, Wis.; general counsel, Marquis Eaton, of Chicago. Directors are named as William E. Mason, David W. Medbury, Robert T. Newberry, architect; Marquis Eaton, B. C. Cook and H. Jefferson O'Brien. This organization owns valuable mineral springs at this point and the plans of the company, which is incorporated under the laws of the state of Maine, with a capital stock of $1,000,000, is to build a large hotel and to boom the place as a health resort. Most of the eastern roads entering Chicago run within a few miles of each other at this point. Steamer service on Lake Michigan is also proposed. "Our purpose is to erect the poolroom at once and to start work on the race track as soon as we can. A part of the big building that we will put up will be ready for use within a very short time. We will have ample protection to run our business there without molestation. I have the documents in black and white to show from whom my protection comes. The stories that have come from Laporte about the racetrack being put up by one or the other of the racing functions is wrong. My backers are all men of ample means to carry this proposition through and there is no uncertainty of the deal being consumated. 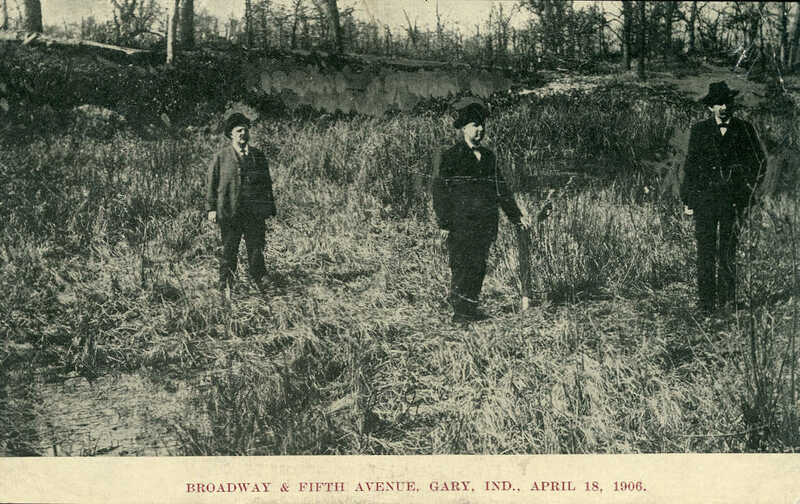 "The Wabash road has given us a 50-cent round-trip rate, but we must guarantee 1,000 passengers a day. The article in the last issue of The Tribune resulted in calling the attention of the metropolitan press to the scheme of L. Jay Carter, and smoking him out of his hole of secrecy. L. Jay Carter, it will be remembered, came here as the successor of Charley Schultz as custodian of what is now known as The Carlsbad Spring property. The troubles of Carter need not be rehearsed here, but when it is known that he is the man behind the wonderful things promised on the Suman farm, folks here smile, and that is all they say. Monday evening's Chicago Daily News gives an interview with Carter. His statement that he has everybody fixed, is characteristic of the man. As a matter of fact, we learn that Carter has obtained an option on 57 acres of land owned by John and Robert Busse, of Liberty township, upon which he paid down the munificent sum of $50. The time for making good expired last Saturday. Tuesday morning postmaster Busse telephoned this office that so far as he was concerned the deal was off, and that he would not extend the option. The statements made in the Daily News articles regarding the men who are behind Carter are ridiculous. It will be noticed that he is very careful not to name any one as being connected with him in the pool room scheme, but is very willing to bring out the directory of the Carlsbad company, whose property is in block 34 in Chesterton. The public may rest assured that the men mentioned will never have anything to do with a poolroom scheme, and I doubt very much whether they will with Carter either. Mr. Eaton has gone on record very strongly on that point. The Tribune believes that Carter is trying to start a poolroom on the land in question, and run it as long as the authorities will permit, and then skedaddle. The Porter county public may rest assured of one thing, Governor Hanly has not been fixed by any pool room gang from Chicago. Neither is Sheriff Green, Prosecutor Boone or Deputy Parks. We do not believe that Mr. Harris, of Worcester, one of nature's true noblemen, and who has $100,000 invested in land here, will ever lend his influence to such a scheme. We are loath to believe that President Darling, of the Porter Land company, will countenance it. We do not take the matter seriously now, for even though Carter had induced some gamblers to back him, they will cut bait when they realize that his find is not what was promised. Postmaster Busse, one of the owners of the land proposed to be bought for race track purposes, stated Wednesday night that up to that time Carter had done nothing towards closing up the land deal. He promised to do so by today at noon. Mr. Busse said that if the deal was not closed by that hour, that he would call the deal off, and would refuse to consider any more propositions from Carter. He would demand the principals and immediate cash and a higher price. Since the above was put in type the Tribune received the following communication from President Darling of the Porter Land Co. 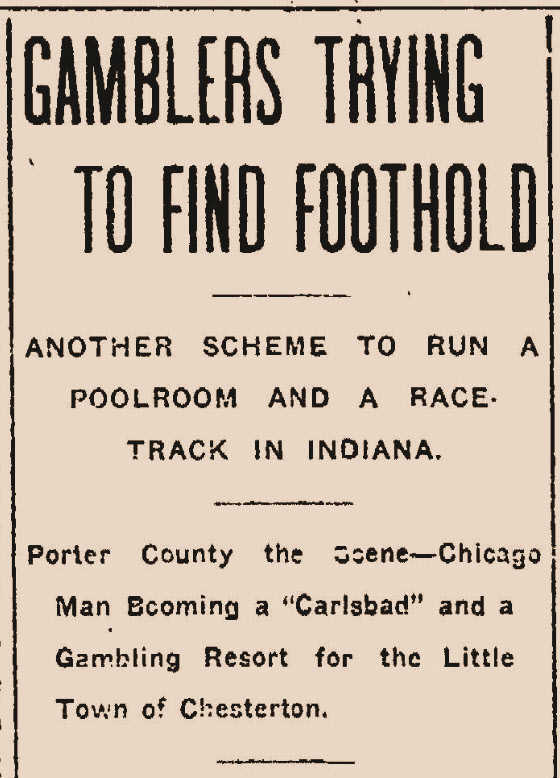 In view of the fact that nearly all of the Chicago papers are publishing erroneous and garbled reports regarding certain prospective improvements in connection with the Carlsbad Indiana Mineral Springs, and a proposed race track in Liberty township, I deem it best to give you the following article for your present week's paper, as I believe the interests of yourself and the readers of your paper will be conserved thereby. Dr. H. Jefferson O'Brien, of Superior, Wis, and officer and director of the Carlsbad company, has been in Chicago for the past two weeks completing details whereby it is expected that either an institution upon a small scale or upon a large scale will be started at an early date on block 34 of the Springs company's property, which said company is acquiring from the Porter Land company. 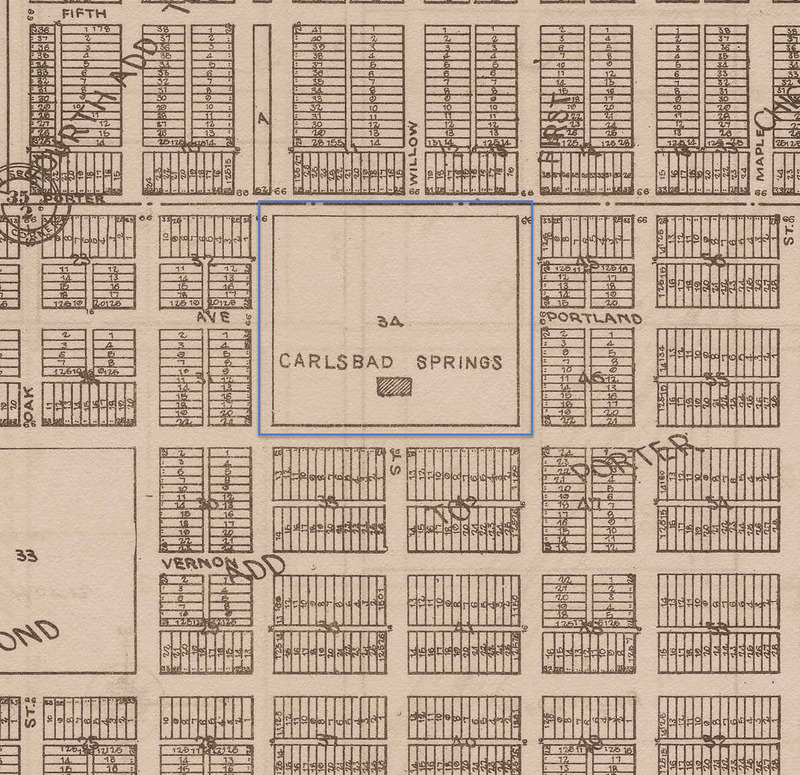 The directors of the Carlsbad company have decided to proceed with the construction of a small hotel building in connection with the former Tribune building, unless Dr. O'Brien and associates are able to complete the arrangements for such capital as is necessary for the construction of the larger buildings according to plans of Robert T. Newberry, an eminent architect of this city, who also is a director and officer of the Carlsbad company. The Carlsbad company also proposes to immediately overhaul the artesian wells on block 34 and to construct a bathing house in connection with the same. 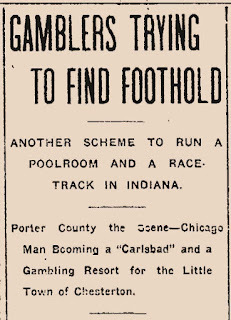 Owing to the fact that L. Jay Carter, formerly an officer and director of the Carlsbad company, is actively engaged in his efforts to promote a racetrack in Liberty township on what was known as the Kroll farm, has led to the conclusion by certain Chicago newspapers, the proprietors of which have doubtless seen the original Carlsbad prospectus, that the two institutions are to be run under the same management and owned by the same people. I desire to say to you in behalf of the Carlsbad Indiana Mineral Springs company, of which I am a director, that there is not nor will there be any connection between the Mineral Springs company and the proposed race track on the Kroll farm or any interests connected therewith. I speak advisedly when I say that there is no possibility of any connection at any time between these two companies. The Carlsbad Mineral Springs company is an incorporation and is preparing to do business. The racetrack company, while it may mature, is yet all in the air and I am not in a position to warrant my saying anything in that connection. I simply know that they have asked for an option on about 20 acres of land owned by the Porter Land company, I should say Mr. L. Jay Carter has asked for an option, the title upon which property they can acquire whenever they present themselves with the cash. 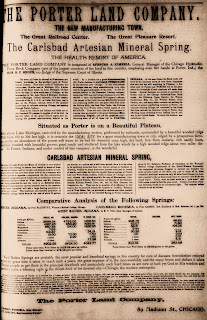 I give you these facts freely because of the reason that three of the leading Chicago newspapers have seen fit to give this proposition conspicuous notice in their columns, and have brought the name of Carlsbad Indiana Mineral Springs company into such association with the racetrack proposition as is liable to do the former proposition much harm. 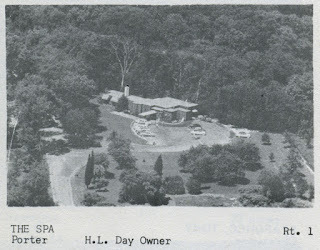 Upon the development of the Mineral Springs Hotel company the institution will be run by men of high social, moral and business standing -- men who will not allow their names to be connected for a moment with any institution such as a racetrack, even though, as we understand it, that company proposes to operate strictly in accordance with the legal requirements of the state of Indiana. I might add that I believe it would be presumptuous on the part of any company to attempt the operating of business along those lines unless they first resolved to comply with the conditions of the law. I desire to say further in connection with Mineral Springs company that Dr. O'Brien and associates are bringing into this company certain gentlemen who occupy high positions in the medical profession as well as other gentlemen of unquestioned integrity and honorable reputations in business affairs, and that the reputations of these gentlemen will be safeguarded in every way. There is one matter that I desire to make conspicuously plain: As the records of recent litigations in Porter county will substantiate, Mr. L. J. Carter, who had a suit in law against the Carlsbad Indiana Mineral Springs company, is no longer connected with that company in any way whatsoever, his interest having been originally purchased by Mr. Robert T. Newberry, whose name appears in this article, and the further fact that all claims held by him have been adjusted and paid for in full and all suits accordingly discharged. LOCAL NEWS OF THE WEEK. This week the contract will be let for the overhauling of the mineral well on the Porter Land company's property. It is proposed to enlarge the well and sink it several hundred feet deeper. Sediment has clogged the pipes until at present there is but a small flow of water, and it is proposed to remedy this. The cost will be considerable. Mr. Darling hopes to succeed this year in establishing a resort in the vicinity of the well, and has excellent prospects of doing so. Mr. Harris of Worcester, Mass., is expected out here soon, and several important decisions will be made at that time regarding future improvements here. 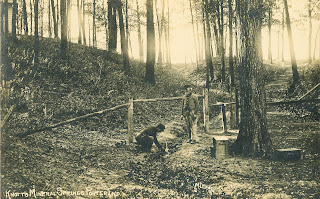 Work at Kimbell Springs is progressing rapidly, although Uncle Bob complains of lack of help. The shrubbery has been cleared away and the whole grove presents quite a different appearance than before. In time, if the plans concerning the beautifying of the place are carried out, the place will undoubtedly be transformed into a beautiful park. Some people think it necessary in order to see beautiful scenery, to leave their homes, and never once give a thought of how pretty their everyday surroundings are. Such people are badly mistaken. Some of the scenery in and about the Calumet valley is as beautiful, of course on a minor scale, as can be found anywhere. At Kimbell Springs there are some really picturesque places, which Mr. Weddell is trying to develop into greater beauty, and has so far succeeded admirably well. Despite what appeared to be a significant development of the Carlsbad Artesian Mineral Springs into a venture that included a possible horse racing track and casino, nothing resulted from this proposed business. No ground was broken, no buildings were constructed. In fact, the Carlsbad property simply appears to have whimpered away as a business. Meanwhile, S. S. Kimbell sold his interest to another prominent developer of Northwest Indiana, Armanis F. Knotts. 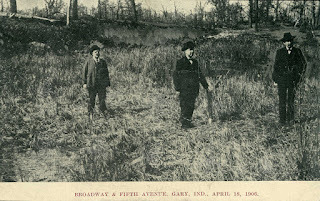 Knotts and his brother, Thomas, were intimately involved with the development of the City of Gary. Thomas Knotts was the first mayor of Gary (1909 to 1913). 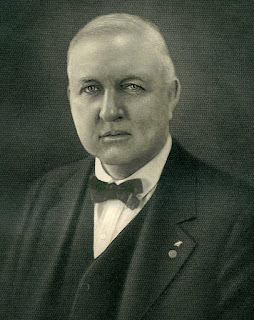 Photograph of Armanis F. Knotts, circa 1920. Armanis F. Knotts served as United States Steel Corporation's attorney when the company decided to locate a mill facility on the shores of Lake Michigan in 1905. A decade later, Armanis became instrumental in the development of the Indiana Dunes State Park, using his political connections and influence as a former Indiana State Representative. Toward the end of his life, Knotts founded the community of Yankeetown in Levy County, Florida. 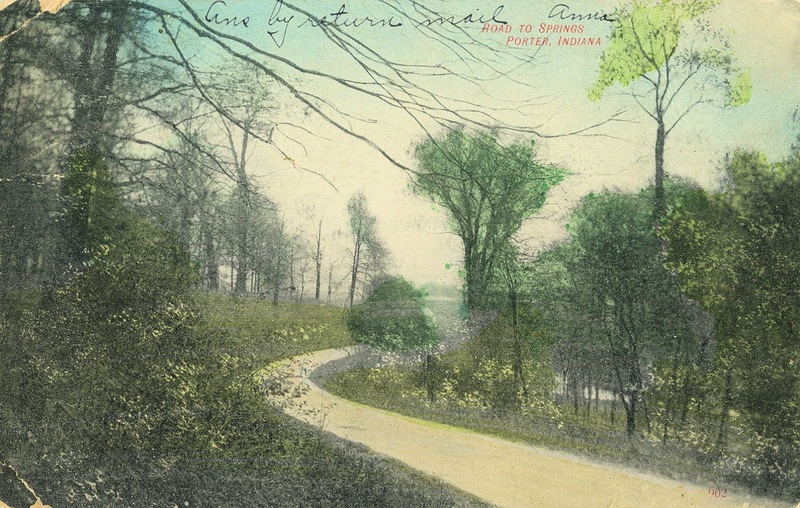 In an ironic twist, Arthur J. Bowser, publisher of The Chesterton Tribune, was adamantly against the formation of Indiana Dunes State Park, as he wished to see the northern portion of Porter County be developed similarly to Lake County. The removal of land for future development purposes was viewed as handicap for the communities located in the northern portion of Porter County. Thomas' brother, Armanis F. Knotts. The man on the right is unidentified. Like Kimbell, Armanis F. Knotts attempted to leverage the mineral springs on his property into something more than a minor tourist haven. He continued the bottling of mineral water from his spring and sold it in local and regional markets. Perhaps through observation of the hardships experienced by the Porter Land Company and the development of its Carlsbad Artesian Mineral Spring, Knotts initially did little with his spring other than rename it Knotts' Mineral Springs. 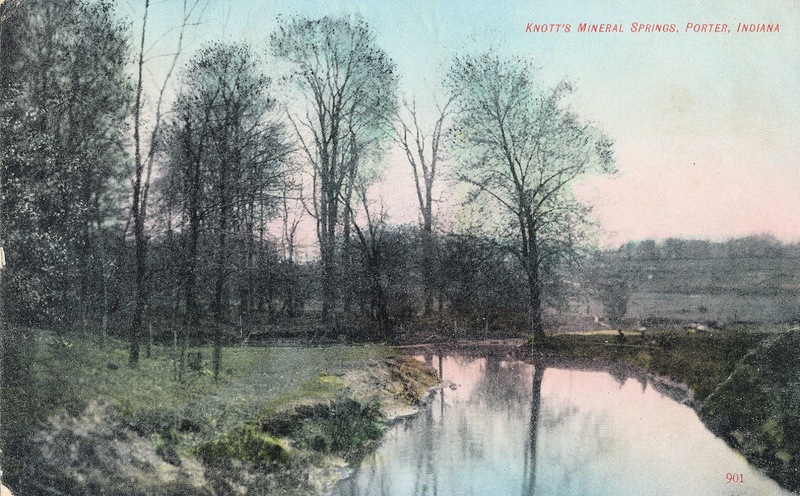 Postcard image of Knotts' Mineral Springs, circa 1908. Knotts' Mineral Springs, circa 1908.
of Knotts' Mineral Springs, circa 1908. In 1912, it appeared that changes were on the horizon for Knotts' Mineral Springs. The Racing Foundation Corporation of America (RFCA) was formed this year with a capitalization of $500,000. Soon after its formation the corporation purchased the Glibertson farm located about three-quarters of mile west of Knotts' Mineral Springs. The purpose of the RFCA was to develop a horse racing track, enticing Chicagoans to the area. Betting on races, however, was to be conducted out of state since it was illegal to bet on horse races in Indiana at this time. The president of the RFCA was none other than Armanis F. Knotts. You can read about the Mineral Springs horse racing venture on another blog post on this site. Obviously, a horse racing track would increase both the visibility and financial viability of Knotts' Mineral Springs. Horse racing at Mineral Springs was a bust due to enforcement of state laws and, more importantly, due to election year politics taking place in Indianapolis. As a result, Knotts' Mineral Springs never became a well developed spa nor a popular tourist location. 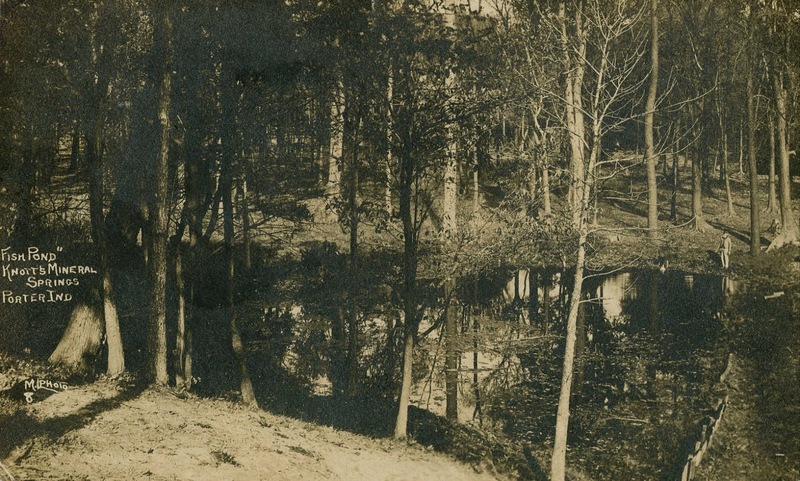 Armanis F. Knotts' property and mineral springs, 1921.
was previously owned by S. S. Kimbell and Armanis F. Knotts. Source: A. I. Silander's Plat Book: Porter County, Indiana. 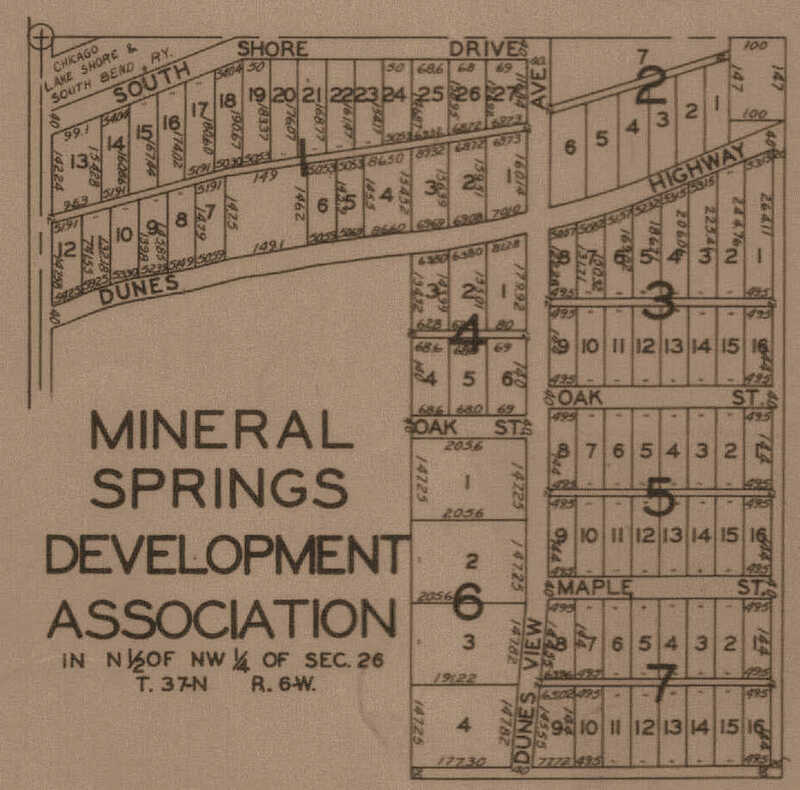 Mineral Springs Development Association, 1928.
three-quarters of a mile north of Knotts' Mineral Spring. 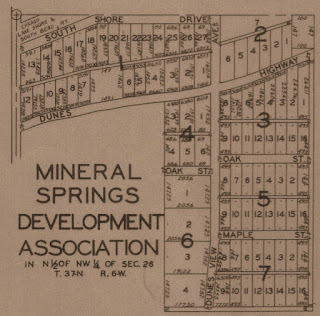 It is believed that at some point in the early 1920s that Armanis F. Knotts transferred ownership of his property from a personally held property to a property owned and operated by the Mineral Springs Development Association. The Development Association also owned property that straddled U.S. Route 12 (Dunes Highway) about three-quarters of a mile north of Knotts' artesian well; it platted this property, but the area never developed into the subdivision envisioned by the plat. The Spa restaurant was opened in 1928, as previously mentioned, and the vision of developing the property a significant tourist location, similar to the Carlsbad Artesian Mineral Springs, withered away. along the Little Calumet River, 1908.
footbridge over the Little Calumet River, 1908. A. I. Silander & Company. 1928. Plat Book: Porter County, Indiana. Rockford, Illinois: A. I. Silander & Company. 58 p.
Hmurovic, John. 2014. "The Battle of Mineral Springs." Indiana Magazine of History 110(2):97-119. The Indianapolis Journal, Indianapolis, Marion County, Indiana; February 17, 1894; Page 2, Column 5. Column titled "Brass Works at Valparaiso." The Indiana State Sentinel, Indianapolis, Marion County, Indiana; February 21, 1894; Page 6, Column 2. Column titled "New Factories Located at Porter and Others Expected." The Indianapolis Journal, Indianapolis, Marion County, Indiana; May 26, 1894; Page 5, Column 3. Column titled "Porter County Land Company." Chesterton Tribune, Chesterton, Porter County, Indiana; February 22, 1895; Volume 11, Number 46, Page 1, Column 5. Column titled "Porter Pointers." Chesterton Tribune, Chesterton, Porter County, Indiana; March 1, 1895; Volume 11, Number 47, Page 1, Column 6. Column titled "Porter Pointers." The Indianapolis Journal, Indianapolis, Marion County, Indiana; March 3, 1895; Page 3, Column 6. Column titled "Receiver for Porter Land Company." The Indianapolis News, Indianapolis, Marion County, Indiana; July 26, 1895; Volume 26, Number 199, Page 6, Column 6. Column titled "General State News." The Indianapolis News, Indianapolis, Marion County, Indiana; March 21, 1896; Volume 27, Number 91, Page 1, Column 7. Column titled "The Wabash Sued for Damages." The Westchester Tribune, Chesterton, Porter County, Indiana; January 2, 1897; Volume 8, Number 38, Page 5. Full page advertisement for The Porter Land Company. The Indianapolis News, Indianapolis, Marion County, Indiana; January 23, 1897; Volume 28, Number 42, Page 10, Column 6. Column titled "Improvements at Porter." The Indianapolis Journal, Indianapolis, Marion County, Indiana; May 25, 1899; Volume 49, Number 145, Page 3, Column 5. Column titled "Oil Well in Porter County." The Indianapolis Journal, Indianapolis, Marion County, Indiana; March 8, 1901; Volume 51, Number 67, Page 8, Column 3. Column titled "New Associations." The Chesterton Tribune, Chesterton, Porter County, Indiana; September 4, 1903; Volume 20, Number 22, Page 3, Column 3. Column titled "Carlsbad Mineral Springs." The Fort Wayne Journal Gazette, Fort Wayne, Allen County, Indiana; February 2, 1905; Volume 13, Number 33, Page 3, Column 3. Column titled "Mineral Water Statistics." The Chesterton Tribune, Chesterton, Porter County, Indiana; March 30, 1905; Volume 21, Number 52, Page 1, Column 5. Column titled "Porter Pointers." The Chesterton Tribune, Chesterton, Porter County, Indiana; March 30, 1905; Volume 21, Number 52, Page 4, Column 5. Column titled "Chesterton Items." The Chesterton Tribune, Chesterton, Porter County, Indiana; April 6, 1905; Volume 22, Number 1, Page 1, Columns 5-6. Column titled "Pool Room at Porter. Monster Betting Resort, Not Track, is Planned at Indiana Town." The Fort Wayne Journal Gazette, Fort Wayne, Allen County, Indiana; April 11, 1905; Volume 13, Number 101, Page 7, Columns 2-3. Column titled "Gamblers Trying to Find Foothold. Another Scheme to Run a Poolroom and Race-Track in Indiana." The Chesterton Tribune, Chesterton, Porter County, Indiana; May 4, 1905; Volume 22, Number 5, Page 5, Column 5. Column titled "Local News of the Week." The Chesterton Tribune, Chesterton, Porter County, Indiana; May 4, 1905; Volume 22, Number 5, Page 8, Column 5. Column titled "Baillytown." The Plymouth Tribune, Plymouth, Marshall County, Indiana; September 20, 1906; Volume 5, Number 50, Page 8, Column 3. Column titled "Local News." The Vidette-Messenger, Valparaiso, Porter County, Indiana; December 31, 1959; Volume 33, Number 151, Page 12, Columns 3-5. Column titled "Calumet Region is Book Topic" by Warren Reeder. The Times, Munster, Lake County, Indiana; December 11, 2012. Column titled "Porter Town Council Moves to Help Shuttered Spa Restaurant" by Heather Augustyn. Thanks! I wish I could find more information about the business transactions concerning the Carlsbad Springs. I've read that a prospectus was published for potential investors of this proposed resort, but I have not been able to find an existing copy of it. It's great to hear from you! I hope all is well.